This mornings skies were cloudy, obscuring the Dolomite spires above. The forecast was for showers. So Sherie and Ben opted to do an “active recovery” day. That meant a fairly leisurely breakfast, and dressed in our matching red ICC jerseys for a midmorning start to a short bike ride. We rode up Passo Campolongo. From the start in town, the train of greyhound slim cyclists in full kit and carbon bikes was huge. It seemed every fifty meters there was a group, in shared team colors, of two to four to six to ten riders. And none of them were moving as slowly upward as Sherie and me. In many hotel car parks were multi-colored cars, with team stickers and bike racks, often with lean men preparing racing bikes. Yikes! The Maratona is going to be one hard corps event! 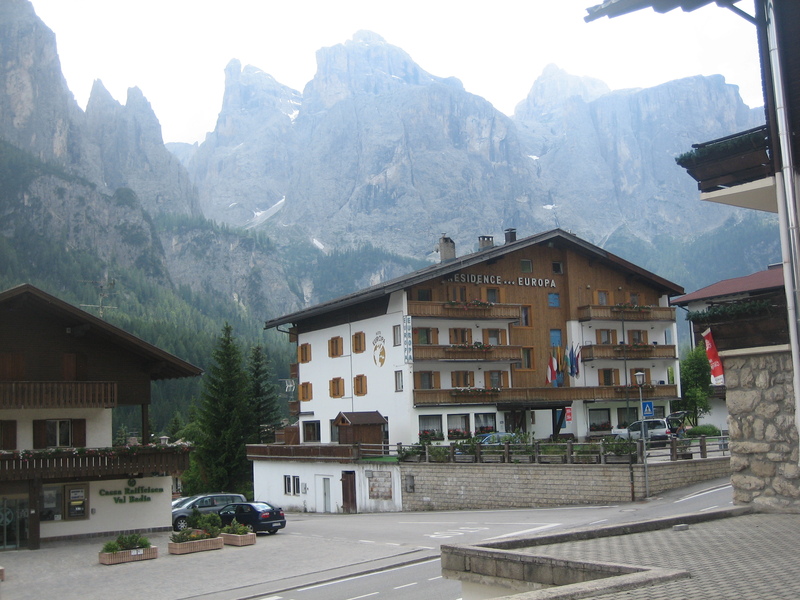 We took it pretty easy up to Passo Campolongo, and stopped at the top to admire the parade and be part of the scene. The were easily many hundred cyclists going one way or the other here above Corvara, plus the assorted autos, packs of hot road motorcycles, cargo trucks, cement mixers, and even a few mountain bikers. After some time we turned around, not to do a Selle Ronde today, being conservative with our energy and the lowering clouds. We swooped down valley enjoying the speed, until a slow car made us pause. Or until Ben stupidly dropped his chain, then backpedaled in a way that opened the master link! Duh! What a Homer move! 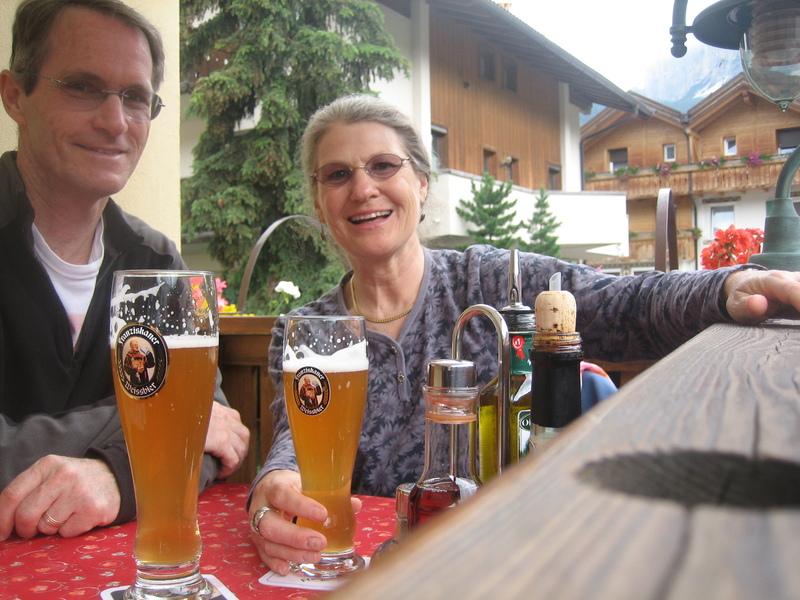 Sherie had gone on, and when Ben finally got it together and joined her in Corvara she had been worried. 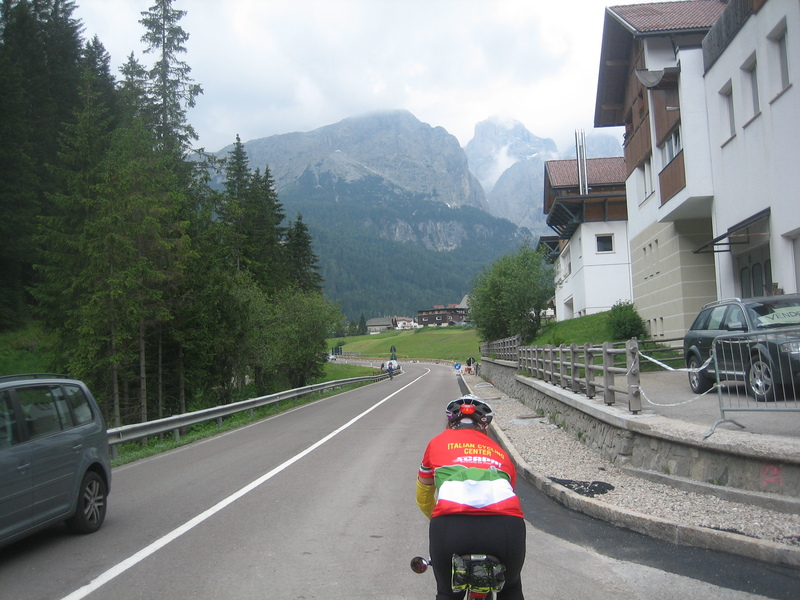 To extend the workout, we continued downhill through La Villa to Badia, sightseeing the towering peaks poking through the clouds and the meadows, hotels, trees. Ladin country is sure a Munchin land, as pastoral below as spectacular above. After turning around, we returned to our hotel by noon. A shower, quick laundry, then a walk to town for that perfect recovery meal: pizza and weissebeir! 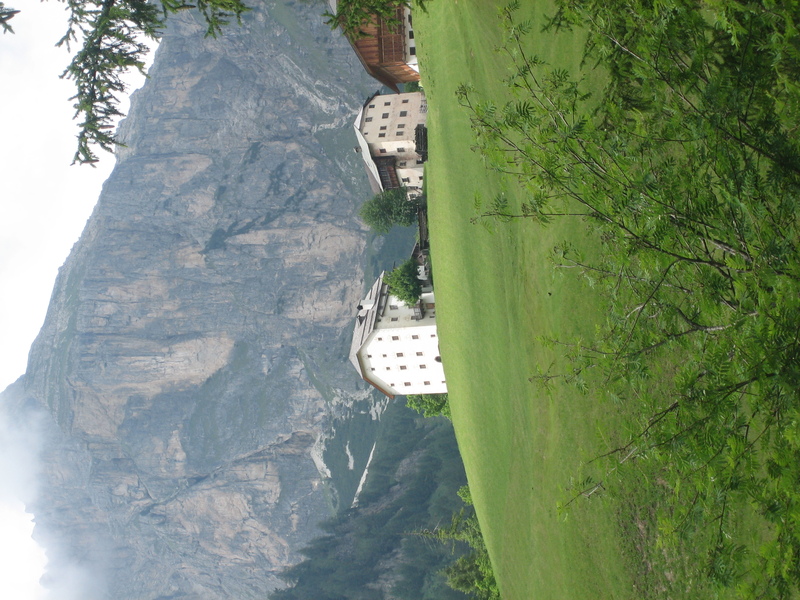 To recover from the lunch calories, we walked west up to Colfosco beside the stream, then returned to the hotel on a traverse under the towering Sassongher in time to watch the Tour de France while writing this entry.